Nothing screams out Valentine’s Day like chocolate. 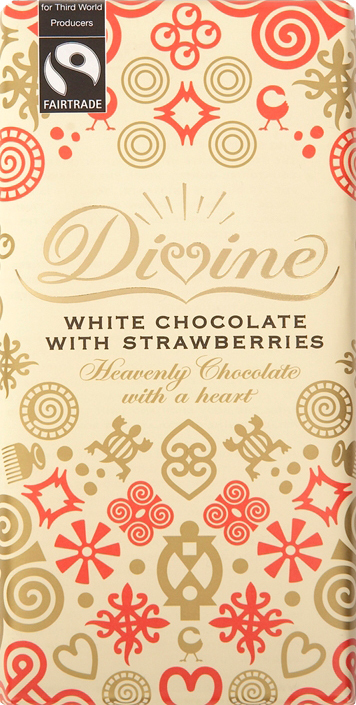 You’re in for a treat with what Divine Chocolate has to offer this Valentine’s Day. Last week I received an early Valentine’s Day treat including a variety of chocolate to bake with, to eat, and more! 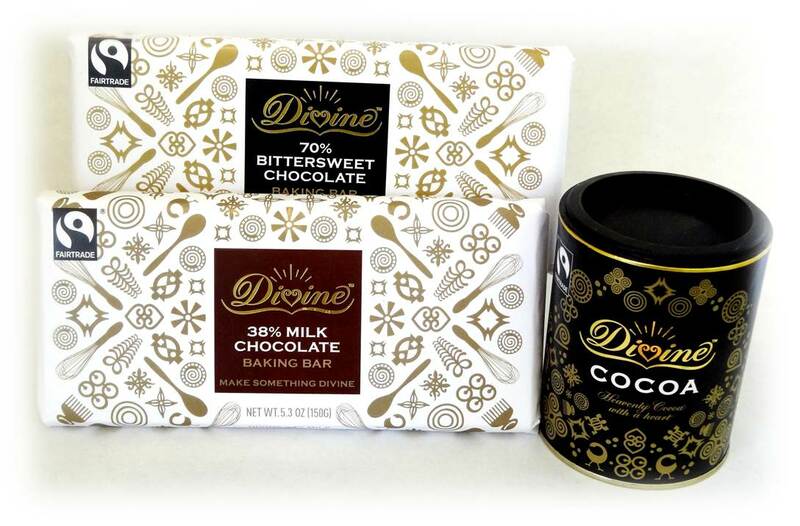 Divine Chocolate, the premium Fair Trade brand owned by cocoa farmers, has a delicious array of Valentine’s Day treats for lovers and lovers of chocolate. When I saw the Milk Chocolate hearts in my package I couldn’t wait and had to try them and they were surely worth it! They were so good that I had to start eating the dark chocolate hearts before I got sick last week! I plan on conquering the rest of the chocolate once I’m back to full health in time for Valentine’s Day next week. I’m also hoping to come up with some Divine Chocolate recipes in time for the holiday. 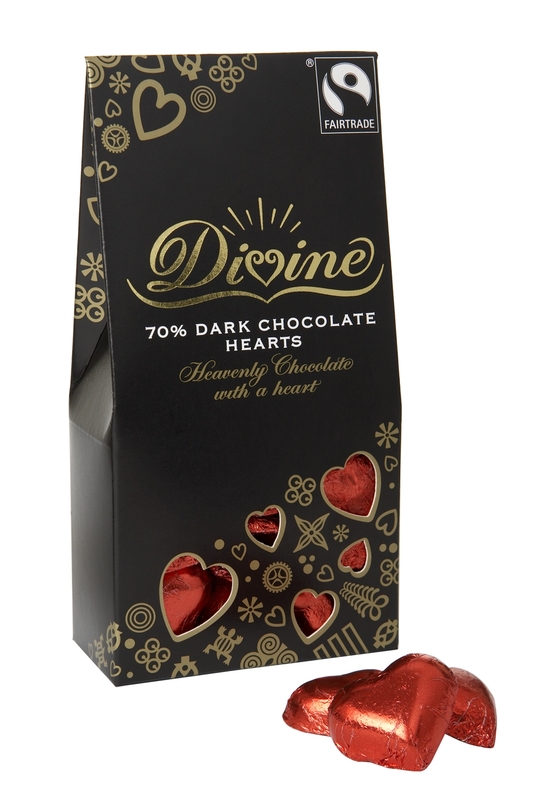 Divine 70% Dark Chocolate Hearts – Critically-acclaimed, smooth, rich, dark chocolate hearts wrapped in shiny red foil, glinting through heart-shaped cut-outs in a black and gold cathedral pack. Divine Milk Chocolate Hearts — Milk chocolate hearts made with the finest cocoa, smooth cocoa butter and real vanilla. Wrapped in gold foil revealed in red and gold packs. 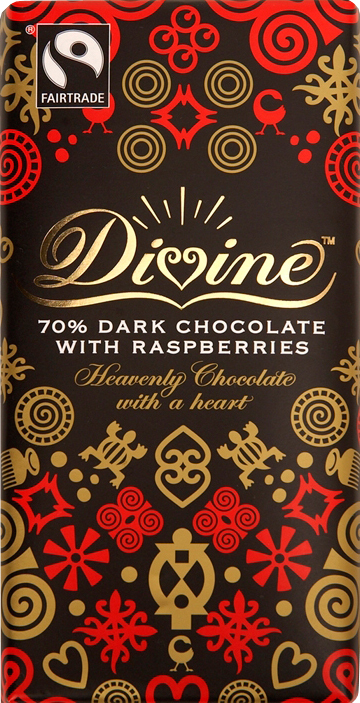 70% Divine Dark Chocolate with Raspberries — Smooth, rich, 70% dark chocolate with the fruity tartness of real raspberries. Divine White Chocolate with Strawberries — Smooth white chocolate made from the creamiest cocoa butter with crunchy pieces of real strawberry crisp. Three winners will be picked randomly and announced this Sunday at noon! PS: If you’re planning on being in New York for Valentine’s Day you’ll want to enjoy a special Divine-inspired menu, chocolate giveaways and more at Ivy Bakery (138 West Houston Street, between Sullivan and MacDougal, New York, NY 10012) on Valentine’s Day. You can find out more details & RSVP, here. 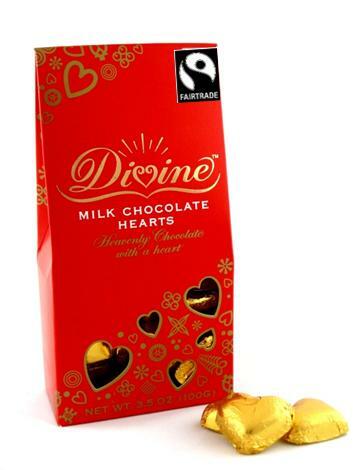 This entry was posted in Divine Chocolate, giveaway, Sara Monica, SCBD, Small Chick Big Deals, yummy and tagged chocolate, divine chocolate, fairtrade chocolate, giveaway, ivy bakery, scbd, small chick big deals, valentines day by smallchickbigdeals. Bookmark the permalink. I liked both facebook pages as wendy wallach zephier and I should win because I think chocokate is the ultimate indulgence and I really need a little indulging with all this cold and snow! i liked both pages on facebook as required as wendy wallach zephier and I should win because chocolate is the ultimate indulgence and after all this cold and snow I could use a little indulging. I need to win because I am a choco-holic, especially when it comes to white chocolate! That one looks extra-good! chocolate is my happy treat. and I deserve to win to keep myself replenishing my serotonin levels. I like you both on Facebook (FB name: Madeline Brubaker). I should win because I adore any chocolate, and love to try new kinds (and I’ll share with my family). I liked both pages on facebook. I should win because I am a fool for chocolate and so is my hubby! !